In Ruby Schmidt, Suanne Schafer has created a remarkable heroine, one who faces the challenges of time and convention with a vivid spirit and a sense of emotional adventure. It's a pleasure to follow her as she pursues her art, explores her loves and determines to live life on no terms but her own. The protagonist, Ruby Schmidt, moves with ease between rural Texas and urban Pennsylvania, from feeding chickens to studying fine art. Even more delicate, however, is the conflict between traditional family life and bisexual romance. Ms. Schafer's story and character development make that reconciliation seem effortless. 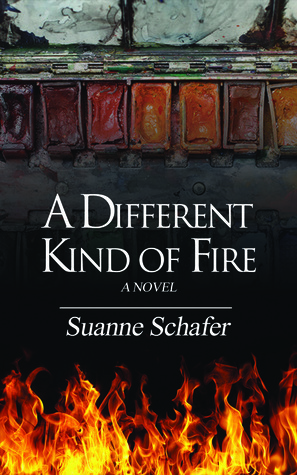 A Different Kind of Fire tells the story of a remarkable woman in turn of the twentieth century America. Over the course of nearly forty years Ruby becomes a painter, a baroness, and a west Texas ranch wife, and she experiences two great loves. Debut author Schafer includes a remarkable amount of historical detail and covers important themes but avoids becoming long-winded or pretentious. Great historical fiction. Quite unique as the main character is a bisexual artist and you don't usually read this kind of a historical novel. I really loved the author's voice. Ruby drew me in right away and I followed her eagerly on her journey to becoming an artist. The story starts in rural Texas and proceeds to an art school in Philadelphia. Lovely characters who came very much alive to me. I'd read this author again for sure.